In the Branch 2013 Battlefield Tour notes reference is made about the graves of two American soldiers who fell in the First World War and lie in Lijssenthoek Military Cemetery. Originally 50 American casualties were buried in the cemetery and later 47 of them were disinterred and reburied elsewhere. The graves of the three who were not disturbed are Lieutenant J.A. Pigue, Sergeant D.S. Beattie and Private H.A. King. James Aaron Pigue was born in 1884 the son of Edward and Fannie Pigue of 2017 Belmont Boulevard, Nashville, Tennessee. They were a devout family and worshipped at the First Baptist Church. James, who was more commonly known as 'Jim' had from an early age wanted to be a soldier. In 1901, at the age of seventeen he attended the Virginia Military Institute and three years later joined the United States Marine Corps. After successfully completing his training at Annapolis he was one of six men selected from his course for special service duty in Panama. It was during 1904 that construction began on the building of the Panama Canal. For his service there he was awarded the Panama Campaign Medal. In 1905 he returned to the United States and was commissioned as a Lieutenant. In that capacity he served at sea in the North Atlantic, Mediterranean and at shore bases both in America and abroad. He was honourably discharged in 1909 from the US Marine Corps having been awarded two service medals and returned to civilian life in Nashville. His mother died in 1912 and he continued to live with his father in the family home. In 1916 trouble flared up along the United States-Mexican border and Jim enlisted into the First Tennessee National Guard Regiment. His previous military experience gained him promotion to Second Lieutenant. The regiment was mobilised for federal service and sent to Texas where Jim was promoted to Lieutenant and received two more medals. Whilst in Texas he courted and married Jane Weller against the wishes of his father. They both returned to Nashville in the autumn of 1916 where Jim was discharged from his regiment and returned to civilian life. When America declared war on Germany on the 6th April, 1917 - they declared war on the Austrian-Hungarians on the 7th December - Jim was recalled for duty with the First Tennessee National Guard Regiment. They were mobilised for federal service and initially based at Camp Jackson in Nashville, before moving to Camp Sevier in Greenville, South Carolina. There the regiment was converted into a Heavy Artillery Regiment. Preferring infantry service, Jim transferred to the Third Tennessee National Guard Regiment which became the 117th Infantry Regiment of the 59th Brigade in the United States 30th Division. In the first week of May 1918 the regiment embarked for Europe and Jim bid farewell to his pregnant wife and the son he would never see. Arriving in Europe the regiment was sent to Belgium for training with the British Second Army. During the early months of 1918 four American Divisions were deployed with French and British units to gain combat experience in relatively quiet sections of the Allied lines. Lieutenant Pigue was given command of a battalion of his regiment in July and on the 16th they entered the front line to the east of Poperinghe. On the 18th Jim was at an observation post when he was shot and killed by a sniper. He was 34 years of age and the first man in the American 30th Division to be killed in the First World War. When the sad news about his death eventually reached Nashville, a memorial service was held at the First Baptist Church. His father who although was displeased with his son's marriage was proud of Jim and commented that "my boys heart was in the service of his country." Lieutenant James Pigue was originally buried in Gwalia British Cemetery. In June 1919 his body was disinterred and reburied in the American section of Lijssenthoek Military Cemetery. After the death of her husband Jane returned to Texas with her young son. The United States Army wrote to her in 1920 asking if she wanted Jim's body returned to America. Replying, she was most emphatic that she did not want his body disturbed. The American authorities unlike the British were prepared to repatriate the bodies of those who had been killed at the request of their relatives. Having re-married in Texas Jane did not respond to further enquiries by the US Army. Frustrated the authorities wrote to Jim's father asking him to complete the necessary paperwork for their records. He gratefully acquiesced and in 1921 visited his son's grave at Lijssenthoek. 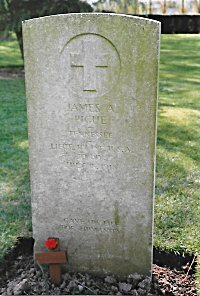 There he met officials from the Imperial War Graves Commission who assured him that they would look after Lieutenant Pigue's grave in perpetuity. Satisfied his father asked for his son's headstone to be inscribed with the words 'Gave His Life For Humanity'. David Stanley Beattie was born in 1896 the son of David and Isobel Beattie of 22 Hawthorn Avenue, Troy, New York. He began his education at the local public schools and at the Troy High School from where he graduated. Whilst there he was a member of the debating society and was considered to be a very good speaker. As well as managing the school football team he was also a team player and wrote articles as the school correspondent for The Troy Times. After leaving Troy High School he was briefly employed as a clerk by the Manufacturers Bank of New York. On leaving there he enlisted into the 2nd Infantry Regiment of the New York National Guard and posted to 'A' Company. The regiment was mobilised into federal service for deployment against Pancho Villa on the Mexican border on the 1st July, 1916. Fortunately the regiment sustained no casualties in the hot, arid and disease infested area of the border. After order was re-established the regiment was discharged from federal service in October 1916 and sent to Camp Wadsworth at Spartanburg, South Carolina. Beattie was transferred to the Intelligence Department and promoted to Sergeant. Six months later in March 1917 the regiment was recalled for federal service prior to America's entry into the First World War. The New York Army National Guard was initially used to ensure the security of railway communications and munitions factories in New York against sabotage. At the beginning of 1918 the regiment was transferred to the 27th Division and re-titled the 105th Infantry Regiment which embarked for Europe in May 1918. After arrival in Belgium the regiment began training with the British Third Army and during July took over a sector of the front line near Dikkebus. On the 31st August, 1918 Sergeant Beattie was sent forward to an advanced observation post with another sergeant. Beattie was watching the movements of enemy troops through a telescope when a shell exploded in front of the post. He was struck in the head by a piece of shrapnel and mortally wounded. Unconscious he was taken to a First Aid Post and died there. He was 22 years of age. 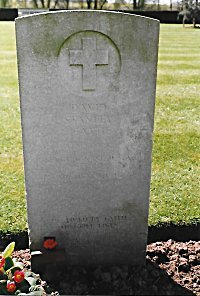 Sergeant David Beattie was buried in the American section of Lijssenthoek Military Cemetery and in response to US Army enquires his family requested that his body remain undisturbed. They had the words "He Lived By Faith. He Still Lives" inscribed on his headstone. Harry Arthur King one of seven children, was born in 1893 at Wichnor Park, Staffordshire, the son of John and Susan King who later resided at 65 Belgrave Road, Longton, Stoke-on-Trent. Longton, was one of the six towns of the Potteries which formed the city of Stoke-on-Trent in 1910. Harry had four brothers, Ernest, George, Reginald, Lewis and two sisters Eva and Alice. Ernest, the eldest son emigrated to America in 1908. Four years later in 1912, Harry, Reginald and George embarked at Southampton for New York seeking a better and more prosperous life. The outbreak of the First World War in August 1914 in Europe was to interrupt their lives. Reginald returned the United Kingdom, enlisted into the British Army and served with the Army Service Corps in the mechanical transport unit. Lewis who had remained in the United Kingdom joined the Army and served in the Tank Corps. George left America and travelled to Canada where he enlisted into the Canadian Army. Harry remained in America and joined the United States Cavalry. Four of the King brothers were by 1917 serving in three different armies. Private Harry King was posted to 'F' Troop, 3rd United States Cavalry, which was one of the few standing forces in the United States. As a consequence on America's entry into the First World War they were one of the first units to embark for Europe in November 1917. As a mounted unit they were employed looking after transport horses and transporting supplies to the front. 'F' Troop managed a remount depot for the quartermaster and artillery batteries near Bourbonne-les-Bain, France. Towards the end of the First World War the battlefields over which the troops of both sides had fought became a breeding ground for disease and large numbers of soldiers succumbed to its effects. 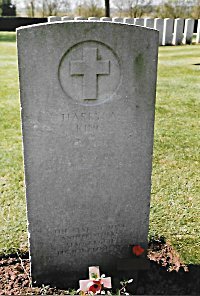 Private Harry King was one of them, having contracted a respiratory illness he died on the 20th September, 1918 aged 25 years. Officially the cause of his death was due to bronchial pneumonia and he was buried in the Argonne American Cemetery at Romange-sous-Montfaucon. The Americans in the First World War lost more men through sickness and disease than they lost from battle casualties. Initially, Harry's mother requested that her son's body be disinterred and returned to England to be buried alongside his father's grave in St Mary's Churchyard Checkley, Staffordshire. However, Reginald serving on attachment to the 25th Siege Battery, Royal Garrison Artillery had been killed in the Ypres Salient on the 17th October, 1917 and was buried in Lijssenthoek Military Cemetery. Although the American authorities allowed repatriation of their service personnel who had died or been killed the British did not. When Mrs King became aware that Reginald's body would not be moved by the British authorities she changed her mind and asked if Harry could be buried near to his brother Reginald in Lijssenthoek. In October 1921, Private Harry King's body was removed from the American Cemetery and re-interred at Lijssenthoek. Both Lewis and George survived the war and returned to America. Mrs King had the words "Best Of Sons And Brothers Also Reggie Buried Close By" inscribed on Harry's headstone. Harry and Reginald are also commemorated on the Longton Cenotaph War Memorial. Grave Locations ~ Lijssenthoek Military Cemetery, Belgium. Lieutenant James Aaron Pigue ~ Section XXXII, Row A. Sergeant David Stanley Beattie ~ Section XXXII, Row A. Private Harry Arthur King ~ Section XXXII, Row A. Private Reginald King ~ Section XXI, Row H. Grave No.17.